THE PAG-IBIG Fund Chorale (PFC) won in three categories during the 8th Grand Prix Pattaya 2015 – International Choir Festival, held on 22-26 July 2015, in Pattaya, Thailand. The lone Philippine representative to the competition, the chorale earned the approval of the judges, garnering enough points to win Gold Medals in the Folklore a Capella category, and the Spiritual, Gospel, and Jazz category, and a Silver Medal in the Adult Mixed category. The Grand Prix Pattaya 2015 is a competition open to non-professional choirs around the world. The PFC was joined by 12 other choirs to compete in various categories. The participants, who may join any of the applicable categories – Children’s Choirs; Boys’ Choirs; Youth Choirs; Adult Choirs (Women, Men, Mixed); Folklore A Capella; Chamber Choirs; Vocal Groups; and Spiritual, Gospel, and Jazz – must present a maximum of three different songs per category to be performed under a prescribed time limit. Well-known international choir masters led by Bangkok Opera Artistic Director Somtow Sucharitkul served as judges at the competition. 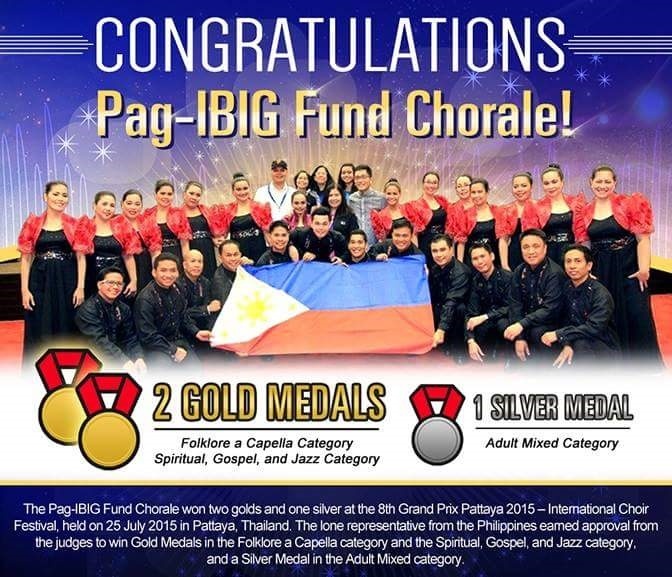 “We are very proud of the Pag-IBIG Fund Chorale’s accomplishments. They’ve already proven their mettle in local performances and competitions. Garnering the top recognition in their first international competition proves that our Fund employees do practice the culture of excellence that Pag-IBIG Fund embodies. With this recognition, they did not only make Pag-IBIG Fund proud but the entire country, as well,” says Pag-IBIG Fund President and CEO Atty. Darlene Marie B. Berberabe. Organized in September 2005 as the Fund’s official choir, the PFC has performed in various local music festivals, including Maestro Ryan Cayabyab’s One Thousand-Voice Choir Project in 2011. The group has also won several competitions, and was declared as the 2014 Grand Champion of the Civil Service Commission’s Government Choral Competition. Guided by Choir Master Anthony Go Villanueva, the PFC has become Pag-IBIG’s Ambassador of Goodwill, spreading camaraderie and goodwill as they perform in various outreach events from government agencies and private institutions.